The United States is linked to the countries of the Western Hemisphere by physical proximity, shared values, and vast cultural, commercial, and demographic ties. The Fulbright U.S. Scholar Program to the Western Hemisphere nations offers scholars the opportunity to work within strong networks that facilitate the efficient movement of knowledge, ideas and technology throughout the region. Application Deadline: August 1, 2018. 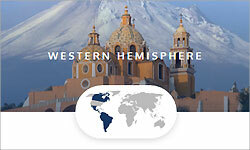 For more information about awards to the Western Hemisphere, visit the 2019-2020 Catalog of Awards.